As Summer starts to tighten it's grip across the country,we often rush to instant coolers like soft drinks,ice-cream,ice-cold water.Often neglecting,traditional cooling foods,we tend to consume what looks appealing on the surface. ONE SUCH TRADITIONAL ITEM IS "SATTU"
Sattu is a cooling food & acts as an antidote to heat.It's very versatile & can be eaten in multiple ways.It has High Level of Minerals,Fibre,Iron & Calcium. Predominantly,Chana(chickpea) Sattu is used although Bajra mixed with it adds the benefits. Being neutral in taste,it easily blends with any dish.It has the phenomenal quality of accepting any flavour be it in sherbets,breads,halwa.It is very filling as well. Sattu is prepared by dry roasting Bengal Gram.The traditional way of preparing sattu involves the use of an iron vessel,in which grams are roasted in sand,sieved & ground to fine flour.This 'WONDER FOOD' that sustains people throuh harsh summers,is truly a labour of love. It originated in the Hindi-Speaking belt of the country comprising regions of Punjab,Uttar Pradesh,Bihar.The method of preparation varies from region to region.It is the quint essential poor man's food-yet nutritious,easy to prepare and consume without any paraphernalia.The food is such an integral part of culture that it is celebrated during festivals. Lots of Fibre,most of which is insoluble,which is great for the gut. It is wonderful for those suffering from Gas,Acidity,Constipation. It provides instant energy,and is excellent source of vegetarian protein. It has Hypoglycemic Index,making it good for Diabetes. It is a good source of Calcium,Manganese,Magnesium,Iron,Vitamins A & C.
It is an indigenous safe protein powder. It helps build muscle mass. 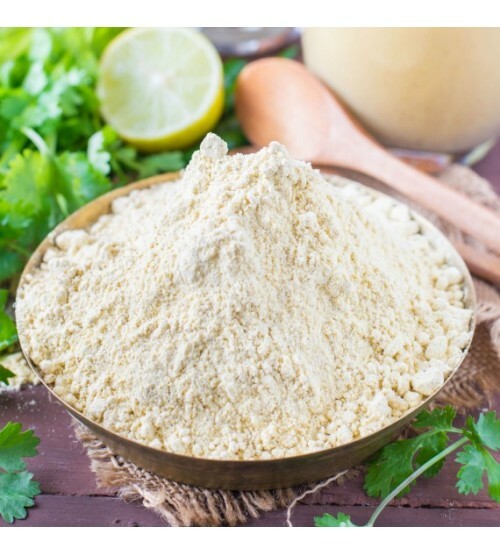 100g of Sattu gives about 400 calories,which mean 2 tbsp(25gm) will only give you 100 calories only. AN EXAMPLE OF THE RICKSHAW PULLERS,COOLIES,LABORERS who are doing such an intensive efforts/labor are the consumers of SATTU from a long time. DT.SHARAN SAYS : Eat Healthy,don't starve yourself.Eat Wisely,don't compromise when it comes to your health because it's the actual wealth you are working for so hard.